A group of nine Indus Valley copper plates (c. 2600–2000 BC), discovered from private collections in Pakistan, appear to be of an important type not previously described. The plates are significantly larger and more robust than those comprising the corpus of known copper plates or tablets, and most significantly differ in being inscribed with mirrored characters. One of the plates bears 34 characters, which is the longest known single Indus script inscription. Examination of the plates with x-ray fluorescence (XRF) spectrophotometry indicates metal compositions, including arsenical copper, consistent with Indus Valley technology. Microscopy of the metal surface and internal structure reveals detail such as pitting, microcrystalline structure, and corrosion, consistent with ancient cast copper artifacts. Given the relative fineness of the engraving, it is hypothesised that the copper plates were not used as seals, but have characteristics consistent with use in copper plate printing. As such, it is possible that these copper plates are by far the earliest known printing devices, being at least 4000 years old. 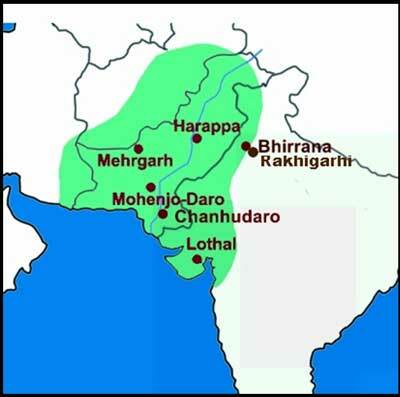 The peak of Indus Valley (also known as Harappan) civilisation ranged from about 2600 BC to 2000 BC. The settled life in the Indian subcontinent started, as is evident at Mehrgarh in Baluchistan (Jarrige, et al., 1995), around 7000 BC and there has been gradual growth in the cultures culminating into the formation of the Harappan culture starting around 4000 BC. While there were minor discoveries of Indus Valley artifacts in the 19th century, it was not until the 1920’s that discoveries and subsequent excavations at Mohenjo-daro and Harappa revealed that a complex and sophisticated society had once thrived along the Indus River region. Indus Valley civilisation seems to have been relatively secular, insofar as no temples or similar structures have been found, although certain dwellings and artifacts indicate that priests and the worship of gods were an integral part of life. The society seems to have been largely mercantile, well organised and relatively peaceful, as there are comparatively few traces of armaments. Mohenjo-daro and Harappa have become celebrated for their comprehensive urban planning that included sophisticated sewerage and control of water movement that allowed structures such as public baths. Almost 90 years since excavations began at Mohenjo-daro and Harappa, it is now apparent that there were dozens of cities and towns in a region that extended across the Indus River region from Baluchistan to Haryana, India, and even into Afghanistan (Figure 1). One of the largest known cities is now being excavated at Rakhigarhi in Haryana (Kaur, 2012). It is likely that Indus Valley cities have largely escaped notice as their construction was based almost entirely on brick; and the millions of bricks have survived poorly, as many have been recycled or have eroded to rubble. Indus Valley civilisation is especially noted for two types of artifact: pottery and seals. The region was likely a production centre for fine utilitarian pottery and much was exported. The iconic seals that are often used visually to symbolise the culture are generally made of steatite (a whitish soapstone). They are typically square, generally ranging in size from about 2.5 to 5 cm on a side, and typically bear the image of an animal such as bull, elephant or rhinoceros and a few characters (average of five) of what is known as Indus script. The seals have a central boss on the back that seems to have allowed the seal to be tied to clothing. Despite the finding of several thousands of these seals, Indus script remains undeciphered, as the script seems unrelated to the image, and is likely some identifier of the bearer. Ideas regarding the meaning of the text on the seals abound, and include theories such as guild affiliation, address, and astrological information, but there is no confirmation or agreement. Other objects do bear script but are less common. Amongst the more interesting of these are over 200 small copper tablets or wafers that also bear image and script but on opposing surfaces. As many of these tablets occur in multiple copies, it is believed that these may be tokens of some sort (Parpola, 1994; p. 112). Map of Indus Valley region showing extent, and key sites mentioned in the text. A set of nine copper plates of Indus Valley origin but of quite different appearance to the aforementioned wafers has recently come to light. The source and history of the plates are poorly known, as the plates lay stored in two successive private collections in Pakistan for many years. The plates were firstly thought to be generally comparable to those from the large corpus of small copper tablets or wafers known from Mohenjo-daro, and thus were given little importance. The copper plates described in this article are believed to date from the Mature Harappan period, 2600–1900 BC. They were given to the second author in 2011, who realized that the plates were unusual, as they were large and robust, and bore mirrored Indus script as found in seals, but the inscriptions were relatively finely incised and unlikely capable of leaving satisfactory impressions, as with a seal. The copper plates superficially resemble large Indus Valley seals, as seven of the plates bear an image of an animal or person, plus reversed text. 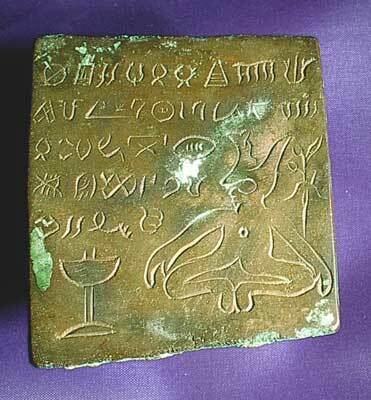 Two of the copper plates bear only mirrored Indus characters boldly engraved in two rows. The plates are illustrated in Figure 2 and basic attributes are given in Table 1. The nine copper plates. Top row: Plates 1–3. Middle row: Plates 4–6. Bottom row: Plates 7–9. Scale in centimetres. Details of the nine copper plates. Inscribed Indus Valley metal objects include seals, small tablets (or wafers) and occasionally tools. Seals similar to steatite seals are known in both copper and silver, but are very rare, and were likely cast for wealthy individuals from sealings taken from crisp steatite seals. Steatite seals were prone to breakage and loss, as the stone is soft and brittle; broken seals, or seals with a broken boss have often been found in excavated streets at Indus Valley sites. Over 200 small inscribed copper tablets have been found at Mohenjo-daro, and these are discussed by Parpola (1994; p. 111); see Figure 3. They comprise three groups based on shape: square, rectangular, and long and narrow. Their average dimensions respectively are: 26.6mm by 26.5mm by 3.5mm; 33.8mm by 26.5mm by 3.5mm; and 33.0mm by 24.0mm by 3mm. Most of these tablets have an inscribed image on one side and text on the other side. Many of the tablets occur as duplicates, where the image and relevant script are consistent from copy to copy. In one rectangular design featuring a bull, 28 copies are known. Parpola believes that these tablets are notable as the text likely relates to the image, unlike seals, and that the tablets were possibly amulets or tokens important for religious occasions. A few copper tablets with script in relief have been recovered also from Harappa, but again the writing is not reversed, and these objects are also regarded as amulets or tokens. 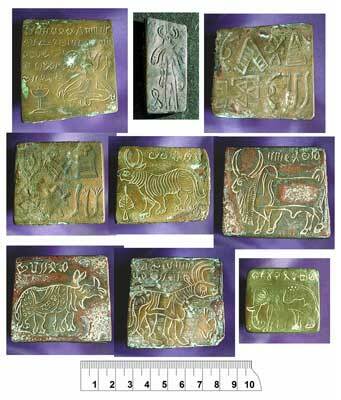 Selection of Mohenjo-daro copper tablets. Scale in cm. Image courtesy of Harappa Archaeological Research Project/Harappa.com and Dept. of Archaeology and Museums, Govt. of Pakistan. It is tempting to compare the copper plates to these tablets, as the base material is similar and they are incised with an image and text. However, there are many important differences that suggest that the copper plates are a distinct and new type of script-bearing artifact. Firstly, the copper plates are substantially larger, and the eight larger rectangular plates have an average surface area of about 28cm2, or over three times that of an average rectangular copper tablet. Similarly they are much more robust, having thickness up to 6.7mm, compared to an average 3.5mm thickness in the tablets1. While the tablets are bifacial, the copper plates have only one surface inscribed, with both image and text. The types of animals depicted on the copper plates are generally the same as those on the copper tablets; however, the style is detailed and more similar to that on steatite seals. Perhaps the most important difference is that with the copper plates, the text is mirrored, as found in seals, and as indicated through several asymmetric Indus script characters. The text on one of the copper plates (Plate 1) has 34 characters in five lines, and thus has more characters and more lines of Indus inscription than any previously known on a single object (Koskenniemi, Parpola, A. and Parpola, S., 1973; p. x), which suggests that the text may be descriptive or instructive, and that this object has a special purpose. Also Wells (2011; p. x) and others have argued that the finding of a Indus inscription of 50 or more characters may allow a breakthrough in decipherment. Finally, it is worth noting that whereas the Mohenjo-daro copper tablets have many duplicates, there is only a single copy of each of the nine different copper plates, and this seems significant2. The plates were examined using conventional microscopy and scanning electron microscopy (Figures 4 and 5). It is apparent that the engraving is contemporary with manufacture of the plates, as the patination is continuous from the surface into the incised lines. Magnification shows that the incised surfaces of the plates have been polished, as there are both parallel and random scratch lines, but it is difficult to say how much of this is associated with recent cleaning of the plates. Scanning electron microscopy of the surface shows these features as well as microdendrites generally associated with the casting and cooling of bronze artifacts. It seems quite likely that the group of copper plates was found originally mostly as a consolidated corroded mass, as several of the plates show pieces of adhering metal (Figure 6). Thus the extant plates are the plates that survived in reasonable condition, whereas other severely damaged plates may have been discarded. This may explain why the most common image on seals, the “unicorn” bull, and others are absent from the set of copper plates. Micrograph of surface of Plate 3 (Nine characters), showing detail of the character in top row, second from right (Indus character 9)3. Irregular dendritic pitting (at top), chatter marks formed during inscription with a broad tool, and corrosion products. Scanning electron micrograph of the surface of plate 2 showing three different features: A) fine scratch marks from polishing; B) microdendritic patination; and C) engraved channel, likely with oil residue. Plate 4 (Seven characters). Left: back, showing corrosion products and adhering metal. Middle: Close-up of lower right edge of plate showing smooth cast surface with etched dendritic pattern. Right: Top edge of plate showing jagged surface due to chiselling and breakage. A small triangular piece of metal about 3.2 mm by 0.8 mm was excised, using a surgical stainless steel knife, from the upper left corner of Plate 3. 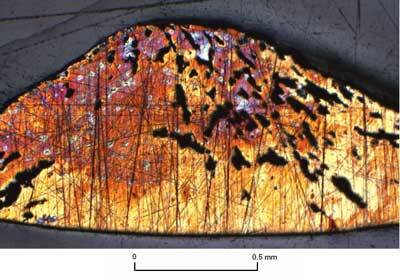 This sample was then mounted in resin, polished and examined with reflected light under magnification (Figure 7). The polished surface was also etched with aqueous ferric chloride (Scott, 1991; p. 72) and examined under magnification and SEM. View under reflected light of corner piece cut from Plate 3. The top curved profile is the corner exterior, and the bottom edge is the cut edge. The polished surface is badly scratched due to degraded particles falling loose during the polishing process. For about 0.4 mm inside the exterior surface, there is severe corrosive pitting. 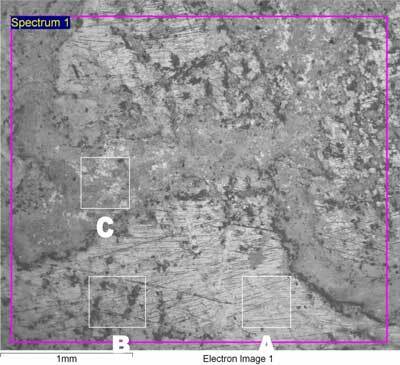 Metallography of a small piece from Plate 3 showed clearly that the metal is ancient, as there was extensive internal corrosion below the surface. The metallography showed little internal microdendritic structure (Figure 8), but this may be due to the bronze being principally an alloy of copper and silver (billion) in the sample. It is clear that the metal is ancient, and certainly precedes any period during which a fake could have been made. One might argue that the engraving has been added to a cache of recovered ancient and diverse blank plates, but this seems contradicted by the continuity of patina across the surface of the plates including the incised lines. 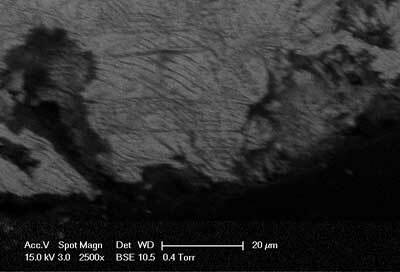 SEM view of outer edge (top in Figure 7) of etched sample from Plate 3 showing micropitting to surface. The incised surface of the plates was analysed with x-ray fluorescence (XRF) spectrophotemetry using an Oxford Isis energy dispersive x-ray (EDX) microprobe fitted to a Philips XL30 scanning electron microscope. An EDX microprobe has a relatively fine beam (<5mm) which thus samples a quite small area, and only analyses the top few microns of a metal surface; thus the results tend to be biased by compounds in surface films such as organic layers and oxides, hydroxides and carbonates. Readings were taken from regions of plates that were uniform in appearance, and free of engraving and obvious corrosion. Results are simplified as % weight metal (Table 2). Percentage metal content (by weight) of the inscribed surface of the nine plates as determined with XRF microprobe. XRF results also showed the presence of substantial amounts of non-metallic elements such as chlorine and carbon, in spite of the fact that the uncleaned back of the plates (see Figure 6), rich in corrosion products, yielded little carbon when samples of this material were subjected to acid digest. It is common practice in Pakistan to treat corroded bronze artifacts with hydrochloric acid, an agent which little affects the copper, but converts carbonate salts to chlorides. The surface of each plate, once cleaned, was likely treated with oil, which accounts for the carbon present. The plates vary substantially in their metal composition, and are roughly divisible into four groups based on the metal secondary to copper in the alloy: 1) only trace secondary metal, 2) arsenic and/or silver, 3) tin, and 4) lead. This diversity in alloy composition is consistent with the prevailing view that Indus cities did not smelt metals, but cast their metal from scrap and pieces of metal acquired through trade from diverse outside regions (Miller, 1997). The composition of the copper plates is quite consistent with known metal production from the overall region (Lloyd Weeks, pers. comm. ), where arsenical copper and tin bronze were in wide use due to the superior hardness of these alloys over copper (Moorey, 1994). The arsenical copper plates, especially those without tin, exhibit a surface patination that shows a distinctive dendritic etched pattern (Figure 6), clearly visible with a hand lens, which is associated with crystalline growth of copper rich components during cooling, and their subsequent loss on the surface due to corrosion and erosion. 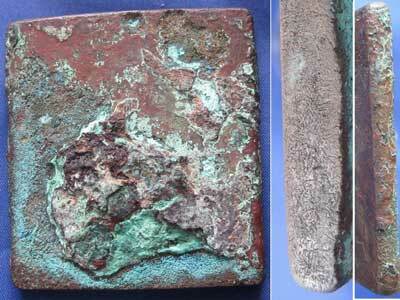 This indicates that the copper plates were cast in a mould and cooled slowly. Most plates have one or two relatively smooth edges, which suggests that the copper was cast in a large shallow mould and then smaller pieces were cut as needed, likely gouged with chisels and then snapped off, which left rough edges (Kenoyer and Miller, 2012; p. 51). Of the nine copper plates, eight show imagery and detail quite similar to seals or tablets excavated from major Indus Valley sites such as Mohenjo-daro, Harappa and Chanhudaro. In most cases, the similarity with respect to detail is striking (Figure 9). Images of seals and tablets (to scale) similar to the copper plates (brackets). Top row: Terracotta tablet from Harappa, Harappa Museum H95–2486 (Plate 1); terracotta tablet from Harappa (Plate 2); steatite seal from Mohenjo-daro, National Museum, Karachi, NMP 50.315 (Plate 3). Middle row: Steatite seal from Mohenjo-daro, Islamabad Museum, NMP 50.289 (Plate 5); Steatite seal from Mohenjo-daro, Islamabad Museum, 50.236 (Plate 6); Steatite seal Mohenjo-daro (Plate 7). Bottom row: Steatite seal, Chanhudaro, Museum of Fine Arts, Boston, MFA 36.971 (Plate 8); Steatite seal, Mohenjo-daro (plate 9). Scale in cm. Images courtesy of Harappa Archaeological Research Project/Harappa.com and Dept. of Archaeology and Museums, Govt. of Pakistan. The most unusual of the copper plates are Plates 1 and 2 which depict a figure or deity with a horned head-dress. No seal is known that is overall comparable to Plate 1 (Figure 10), which depicts a naked figure, wearing a horned head-dress, seated in a yogic position, and bearing a star or gem symbol on his chest, perhaps antecedent to the jewel Kaustubha worn by Vishnu (S. Chandrasekhar, pers. comm.). At the right of the figure is a small plant. Seals with plants are very rare and Sharma (2011; p. 168) notes that only 12 seals are known showing a plant, which is usually the pipal or sacred fig (Ficus religiosa). The plant here is a herb with a taproot, long leaves and two flowers. However, the pipal is a large tree with cordate mucronate leaves (see Plate 5) and relatively insignificant cauliflorous flowers. Thus the plant depicted may be something like tulasi (Ocimum tenuiflorum), a holy plant often associated with Vishnu (Gupta, 2001; p. 54), a poppy4, or Indian ginseng (Withania somnifera). At the left of the plate is a crudely depicted cult object, perhaps a ceremonial vessel, or part thereof, that may be incomplete due to the size of the text. Until recent years, the figure itself seemed atypical of deity representation; however, a bifacial terracotta tablet found by Meadow and Kenoyer in 1994 at Harappa shows a very similar figure (Meadow and Kenoyer, 1997; Kenoyer, 1998; p. 114). Close view of Plate 1 (Horned deity). The deity depicted on Plate 2 is more conventional, and several roughly similar figures are known from iconic seals. The figure wears an elaborate bovine head-dress or mask that seems to have an upper projecting pipal branch. His long hair appears as a braided mass that falls to the left, and both arms bear large bangles. On seals, this type of figure is often accompanied by fig branches, and thus he is sometimes known as the “fig deity”. As with Plate 1, a nearly identical image appears on one of the four rectangular faces of small molded terracotta tablets found by Meadow and Kenoyer in 1994 at Harappa. Plates 3 and 4 bear only large Indus script characters, and no identical seals or tablets are known; however, it is worth noting that an elongate steatite seal from Mohenjo-daro, bearing only characters, has five of its six characters similarly inscribed and in common with Plate 3. 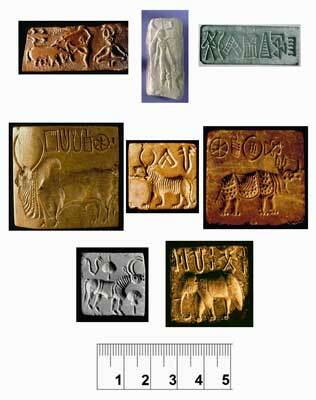 Plates 5 to 9 bear animal images seen on steatite seals. 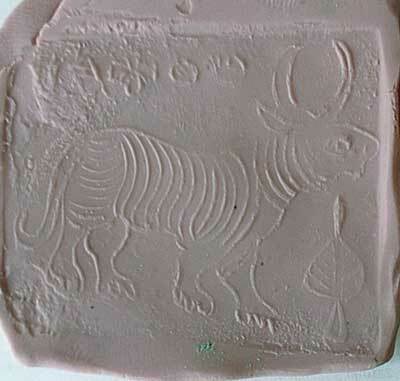 Plate 5 bears a horned tiger, an image comparatively rare on steatite seals, but found on Mohenjo-daro copper tablets. The combination of forms of two powerful animals, the head of a bull and the body of a tiger, likely represented even greater power and/or protection. Whereas seals depicting bulls and even the rhinoceros often provide an altar or trough below the animal’s head, here the horned tiger is given a pipal leaf, a sacred symbol. 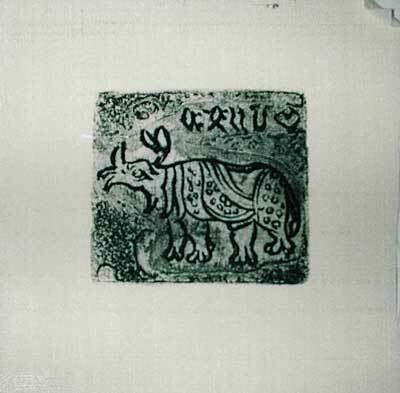 Plate 6 bears a stately zebu bull, and such images are well known from steatite seals. The zebu bull seals are not as common as the “unicorn” or single horned bull seals, and tend to be relatively large seals and often very beautifully and finely engraved. Despite the zebu bull being a domestic animal, it is generally not provided with an altar or trough, likely because the presence of the large dewlap precludes this. On the copper plate, it appears as though the engraver has run out of space to the right, and has had to indicate the tail by means of it looping at the top of the hindquarters. Plate 7 depicts an Indian rhinoceros, an animal once found in the Indus River region, but now restricted to northeastern India. Again this is a comparatively uncommon image on steatite seals. On seals, the rhinoceros can face either right or left, and is depicted with or without a trough. On some rhinoceros seals, the feet are shown incorrectly and resemble those of ungulates. On the copper plate and some steatite seals, the detail shows good observation by the engraver; there are three toes on the rhinoceros foot and the only hair on the rhinoceros occurs on the ears and the tail. Amongst the animal copper plates, Plate 8 is the most unusual as it depicts a sort of antelope that, with its forward projecting horns, is essentially fictitious or perhaps drawn from an uncertain description. Seals with similar animals have been found recently at Banawali, Haryana, India (Bryan Wells, pers. comm. ), and one small steatite seal found at Chanhudaro in 1936 shows a virtually identical animal accompanied by an altar (Mackay, 1943). This unique seal also provides a pipal leaf similar to that mentioned for Plate 5. Plate 9 depicts an Indian elephant, and similar images are found on several steatite seals. The elephant is almost always portrayed on seals facing left, and the presence of the trunk seems to preclude depicting an altar or trough on most seals. All nine plates have inscribed Indus script characters, ranging from one character on Plate 2, to 34 characters on Plate 1. Indus script remains as one of the few undeciphered languages, although there are many self-proclaimed decipherings of Indus script. Indus script has over 400 recognised characters, and remains difficult for epigraphers for several reasons. Firstly, no-one has yet found the equivalent of a “Rosetta Stone”, in this case an object bearing parallel texts in two scripts including Indus. Secondly, the vast majority of the thousands of artifacts that bear Indus scripts are seals, and it is widely accepted that the brief inscriptions, on average about five characters, bear no direct relation to the images depicted, and are in fact references to information about the bearer or their trade. Furthermore the lack of lengthy texts is a barrier to deciphering Indus script. Thirdly, the linguistic basis of Indus script remains unclear; it is generally agreed that it is not alphabetic, but most likely logo-syllabic. However, it is increasingly accepted that some characters may act as a rebus or phonetic allusion to an unrelated word, which may not lend easily to a pictogram. Finally, there still remains controversy over the direction of reading Indus script; most experts agree that the script generally is read from right to left (with seals, this would apply to the sealings), but nonetheless a significant number of texts are known which seem to read from left to right, and some rare longer texts appear to be boustrophedonic, like an ox dragging a plough back and forth across a field, where the first line reads right to left, the second line left to right, etc. The copper plates do not seem to bear many character sequences that closely resemble those found on seals. As the copper plates do not seem to be seals, this is not surprising, since one would expect that the words and grammar used on seals would be quite different from the text on the copper plates which may be descriptive or instructive. In recent years there have been several attempts to use analytical techniques to determine frequency of sequences of characters, e.g. pairs and triplets, firstly to ascertain probable reading direction, and secondly to isolate common character combinations and markers. Unfortunately, the database that drives this sort of work is mostly derived from seal inscriptions, which may be entirely inappropriate for artifacts that are not seals. It is reasonable to be very suspicious of unprovenanced artifacts bearing Indus script, as very recently an Afghan manuscript with purported Indus script on birch bark (Zuberbühler, 2009) was judged to be a fake (L. Zuberbühler, pers. comm.). The copper plates do allow some interesting observations, and clearly warrant expert study. The character numbers cited here follow the system of Parpola (1994; p. 70) who provides an exhaustive table of Indus characters and their variants. Plate 1, in particular, is enigmatic as it bears an unusually lengthy inscription; however, it is unclear whether it reads from right to left or is boustrophedonic (A. Fuls, pers. comm.). Plate 2 seems to bear a single character that is a variant of Indus character 87 which, given its resemblance to a seated skeletal figure, Mahadevan (1999) believes represents the god Murugan (or Murukan), whose early representation may lay the bases of emaciation and asceticism for several divinities in Indian culture. Other authors, such as Parpola (1994; p. 225) have also associated the interlocked circles sign (337) with Murukan, and this may be in reference to bangles worn on the arms. If Mahadevan were correct, then this would be the first instance in which Indus character 87 is unambiguously linked to a deity. It is noteworthy that character 87 and its relation, character 86, appear as well on Plate 1. For most of the plates, the characters, while sometimes crudely inscribed or corroded, are identifiable, although many appear to be variants, which may indicate a regional origin. A good example of a variant character is the right character in the upper row (Indus character 277) on Plate 4. There seems to be some unrecorded characters, e.g. middle character, upper row on Plate 4. On Plate 9, the inscription is apparently upside-down, which suggests that it was added later by an artisan who was perhaps illiterate. Asymmetric characters are present on most of the plates, and are mirrored, which reinforces the argument that the plates were intended to transfer their image to another surface According to preliminary analyses of the texts on the copper plates, there is little similarity in character pairs to that found on seals, which suggests that the texts on the plates are quite different. As mentioned earlier, text is also found on the Mohenjo-daro copper tablets, and Ganesan, et al. 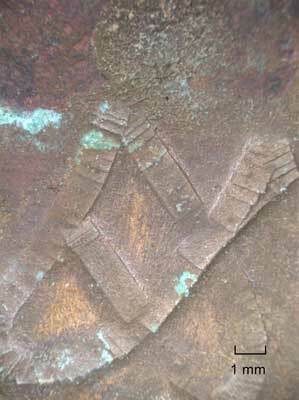 (2009) noted that certain common signs are not known at all from these copper tablets, whereas a number of these same signs, e.g. character 107 (comb sign), 162 (eye sign), and 175 (sigmoid sign) are found in several instances on the copper plates. The copper plates are not identifiable with any particular Indus site, based on style. It has been suggested that the plates should be associated with the Mohenjo-daro copper tablets, but profound differences set them apart. The best matching imagery originates from disparate sites, including Mohenjo-daro, Harappa and Chanhudaro, but there is no reason to attach any great meaning to this as other relevant seals likely remain undiscovered, and seals may have been distributed over substantial distances. 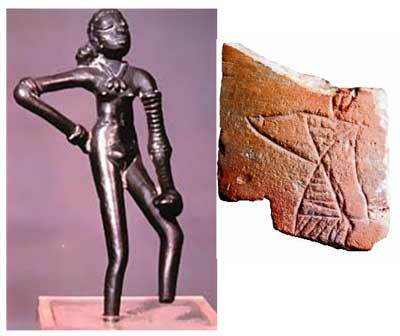 A good example of geographical distance between clearly related objects is the famous bronze “Dancing Girl” found at Mohenjo-daro, and a sherd of pottery, found at Bhirrana, Haryana, India (about 600 km distant), showing a similar profile (Figure 11). The Dancing Girl, a small bronze statue found at Mohenjo-daro, now in The Louvre, Paris, and a pottery sherd from Bhirrana, India. The nine copper plates are unusual amongst comparable copper tablets as both image and text occur on the one side of the plate. It has been argued that some copper tablets may have served as special amulets, and were carried, perhaps wrapped in cloth, on the person. However, the function of the plates here is clearly to impart an image as indicated by the reversed asymmetric Indus script characters. The same occurs with steatite seals, but here the engraving is deep and robust such the seal is capable of leaving a strong relief impression in a pliable medium such as moist clay. Trials with plasticine showed that the copper plates left at best a weak impression (Figure 12). The images imparted were generally indistinct, and relief lines in terracotta would have been quite fragile due to their fineness. The resultant sealing would have been far larger than anything known, and inherently prone to breakage. Impression on plasticine taken from Plate 5 (Horned tiger). 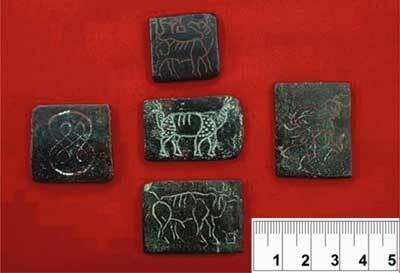 The animal images on the copper plates are very similar to those from certain steatite seals, especially from Mohenjo-daro. The two copper plates with deity images resemble artifacts found recently at Harappa. It is possible that the copper plates served as a library or set of templates for the manufacture of steatite seals and related objects. The occurrence of lengthy text on the plates perhaps provided detail or instructions for craftsmen. The reversed script means that the plates were designed to leave an imprint: 1) either directly on clay, which seems unlikely, or 2) or on a different medium through the transfer of pigment, i.e. printing. As indicated earlier, these plates have a number of attributes that suggest they were meant for a special purpose. The copper plates are unusually thick, and this is surprising as it is recognised that metal was a precious and efficiently used commodity in the Indus Valley. One explanation of the robust nature of the copper plates is that these plates were designed to take substantial pressure, as required in printing. There is evidence that the plates have lost definition of the inscribed image and text; this could have occurred through a combination of surface corrosion, abrasion and repeated application of substantial pressure. Hedges (2006) has shown that with Renaissance copper printing plates, the chief cause of loss of detail is not so much the pressure of a press as commonly believed, which would tend to broaden the lines, but is erosion to the surface of the plate, both through atmospheric effects and repeated cleaning and polishing of the plate surface associated with inking. Over time, the usually V-shaped grooves created by a burin, which hold the ink will tend to become seemingly narrower and narrower, until they disappear. Hedges, in examining subsequent editions of images taken from many different copper plates, estimated that the loss in definition was about 1–2µm per year. Plate 9 (elephant) is instructive here, as the outline of the elephant’s back has completely disappeared toward the centre of the plate, whereas it is quite apparent toward the right. Assumedly cleaning and rubbing of the plate was more sustained toward the middle. As the climatic conditions and associated corrosion are unknown, the wear is not directly comparable to European plates, but nonetheless the decrease in line width from 400µm to 0µm indicates substantial length of usage. If the wear were due to producing sealings with terracotta, one would expect erosion within the incised lines and overall blurring of the image as occurs with well used steatite seals. The proposal that this unique set of copper plates was designed for printing is indeed radical, but offers the most obvious reason for their existence. The principles of printing were perhaps known to Indus Valley artisans through the ancient technique of ajrakh, printing fabric with woodblock designs. It is possible that the copper plates were created firstly to maintain a permanent record of the standard designs on seals and tablets, and furthermore provide a cheap and portable means to distribute standard designs to craftsmen that carved seals in the Indus Valley region. To test this idea, an experimental trial printing was carried out with the plates by Marco Luccio, an artist and master printer based in Melbourne, Australia. Two printing inks were tested: 1) a water-based ink with ferric oxide as the pigment, and 2) an oil-based ink with carbon black. Prints were first trialled with rag paper, but then were printed on tussah silk cloth and parchment, materials which were likely available in the third millennium BC. Almost no organic materials, such as cloth, leather or wood have survived from Indus civilisation, although impressions of woven fabric have been found on terracotta vessels (Kenoyer, 1998; 159). Recently evidence of native silk fibres has been found at Indus Valley sites (Good, Kenoyer and Meadow, 2009), and tussah silk is a cloth still manufactured in northern India from the cocoons of the wild silk moth Antherea paphia, a species closely related to that identified as a silk source by Good, Kenoyer and Meadow. It is known that the Egyptians used leather in the third millennium BC for writing, and parchment documents survive from first millennium BC Babylonia (Diringer. 1982, pp. 172–174). Given the age and condition of the copper plates, the results on all three media tested were surprisingly good, and an example on tussah silk is given in Figure 13. Print on tussah silk taken in 2012 from Plate 6 (Rhinoceros). The implications of this are truly remarkable. It is possible that true printing was first discovered in the Indus Valley in the third millennium BC, at least 1500 years before any other printing process was recorded elsewhere, and the prints taken from these ancient copper plates provide the earliest known artwork in printed form. While this conclusion is astounding, all evidence points to the copper plates being genuine artifacts from antiquity, and their function as special. The nine different copper plates appear to be the sole surviving members of a set of a unique type of copper plate not seen before among Indus Valley (Harappan) artifacts. They are quite different from the corpus of other metal plates or tablets recovered from Mohenjo-daro and Harappa, as they are larger and much thicker, but most significantly they bear inscription only on one surface and the script is reversed. Data from all tests, including x-ray fluorescence metal analyses, conventional and scanning electron microscopy, and metallographic analysis are totally consistent with metal artifacts from Indus Valley (Harappan) civilisation, c. 2600–2000 BC. Similarly, the iconography and script relate well to other Indus Valley artifacts, such as seals, made from steatite or terracotta. The precise source of the copper plates remains unknown, but is assumed to be either Mohenjo-daro or Harappa, based on iconographic similarities to known copper tablets and steatite or terracotta seals. The copper plates are highly significant for two principal reasons. Firstly, they bear inscriptions in Indus script, a language that still remains essentially undeciphered, and one plate in particular bears the longest known single inscription in Indus characters. It is possible that, unlike the relatively common steatite seals where the few incised characters are generally deemed not to relate to any image on the seal, the text on the copper plates described here relates directly to the images, and may thus present a unique tool to progress the epigraphic analysis of Indus script. Secondly, the fine and shallow engraving, the robust structure of the plates, the wear of the inscribed metal surface, and the reversed characters, are all consistent with the copper plates having a function for printing. Trials with simple ferric oxide and carbon black inks confirm that the plates can provide, even after over 4000 years, quite satisfactory printed impressions on media including silk, as would even been available four millennia ago. Thus it is suggested that these unique cooper plates are the world’s earliest known printing plates, and moreover, would have provided the world’s earliest printed works of art. 1According to B. Wells (pers. comm. ), the thickness of the Mohenjo-daro tablets range mostly between 1.8mm and 3.0mm. 2If there had been, hypothetically, duplicate plates, say two copies of each of the nine different plates (total 18 plates), then the probability of a surviving set of nine plates being all different is small, approximately p≈0.01. 3According to list of Parpola (1994; p. 70). 4The opium poppy is known from Sumerian culture c. 4000 BC, and poppy seeds c. 2000 BC have been reported from Sanghol, India, east of Harappa (Fuller and Madella, 2000; p. 338). Diringer, D. (1982). The book before printing: ancient, medieval and oriental. New York: Dover Publications. Fuller, D. Q. and Madella, M. (2000). Issues in Harappan archaeobotany: retrospect and prospect In: Settar, S. and Korisettar, R. eds. Indian archaeology in retrospect, Volume II, Protohistory, archaeology of the Harappan Civilization. New Delhi: Manohar, pp. 317–390. Ganesan, S., Subramanian, C., Babu, S., Nair, S. and Mahadevan, I. (2009). The Indus Script: text and context, a statistical-positional analysis of significant text segments. Bulletin of the Indus Research Centre 1: 1–54. Gupta, S. M. (2001). Plant myths and traditions in India. 3rd ed. New Delhi: Munshiram Manoharlal Publishers. Jarrige, C., Jarrige, J.-F., Meadow, R. H. and Quivron, G. (1995). Mehrgarh field reports 1975 to 1985 – from the Neolithic to the Indus Civilization. Karachi: Department of Culture and Tourism, Government of Sindh and the French Foreign Ministry. Kenoyer, J. M. (1998). Ancient cities of the Indus Valley Civilization. Oxford: Oxford University Press. Kenoyer, J. M. and Miller, H. M.-L. (2012). Metal technologies of Harappan In: Sharma, D.P. ed. Science and metal technology of Harappans. New Delhi: Kaveri Books, pp. 25–65. Koskenniemi, S., Parpola, A. and Parpola, S. (1973). Materials for the study of the Indus script. I. A concordance to the Indus inscriptions. Annales Academiae Scientarum Fennicæ, Series B 185: 1–611. Mackay, E. J. H. (1943). Excavations at Chanhu-daro 1935–36. New Haven: American Oriental Society. Mahadevan, I. (1999). Murukan in the Indus script. Journal of the Institute of Asian Studies 16(2): 21–39. Meadow, R. H. and Kenoyer, J. M. (1997). Excavations at Harappa 1994–1995: New perspectives on the Indus script, craft activities and city organization In: Allchin, R. and Allchin, B. eds. South Asian archaeology, 1995. New Delhi: Oxford and IBH, pp. 139–172. Miller, H. M.-L. (1997). Investigating copper production at Harappa: Surveys, excavations and finds In: Allchin, R. and Allchin, B. eds. South Asian archaeology, 1995. New Delhi: Oxford and IBH, pp. 245–252. Moorey, P. R. S. (1994). Ancient Mesopotamian materials and industries: the archaeological evidence. Oxford: Oxford University Press. Parpola, A. (1994). Deciphering the Indus script. Cambridge: Cambridge University Press. Scott, D. A. (1991). Metallography and microstructure of ancient and historic metals. The Getty Conservation Institute. Sharma, D. P. (2011). Rare seals and Harappan civilization In: Sharma, D.P. ed. Decipherment of Harappan script. Delhi: Pratibha Prakashan, 1pp. 162–190. Wells, B. J. (2011). Epigraphic approaches to Indus writing. Oxford: Oxbow Books. Zuberbühler, L. (2009). A comparison of a manuscript with the Indus script. Unpublished Bachelor Thesis In: Department of Linguistics and Literary Studies Institute of Linguistics, University of Bern.